5 8 P R I N T W E A R J A N U A R Y 2 0 1 9 Not all products can withstand the same degree of heat. Polyester and dye-sublimated fabrics are two examples of shirts that can scorch or bleed if subjected to heat that is too high. Use a heat transfer vinyl designed for a lower temperature and that contains dye blockers. Not all products can withstand the same degree of heat. The first step when heat pressing a garment is to read the gar- ment label. 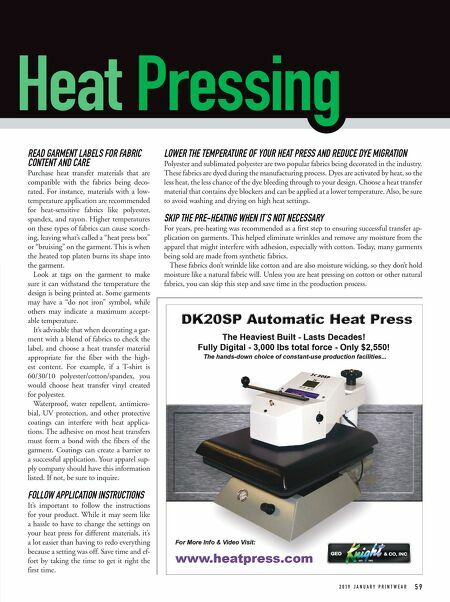 With this in- formation, you can en- sure you are using the right heat transfer product on the shirt. (All images cour- tesy Stahls') The most fool-proof and efficient way to position graphics on a shirt is to use a laser alignment system. Using a layout guide, you position your lasers and then it's a simple matter of loading the shirt and placing the graphic inside the laser points and lines. 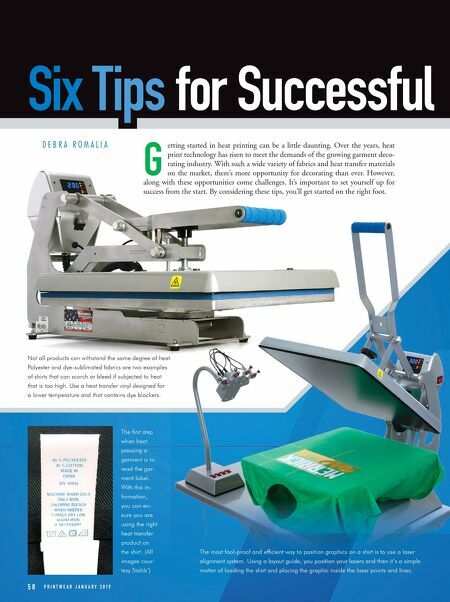 Six Tips for Successful D E B R A R O M A L I A G etting started in heat printing can be a little daunting. Over the years, heat print technology has risen to meet the demands of the growing garment deco- rating industry. With such a wide variety of fabrics and heat transfer materials on the market, there's more opportunity for decorating than ever. However, along with these opportunities come challenges. It's important to set yourself up for success from the start. By considering these tips, you'll get started on the right foot.